1. 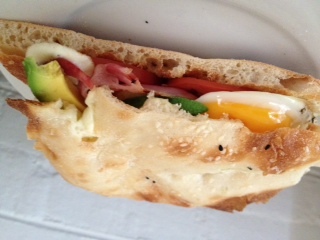 Slice turkish bread in two, add bocconcini to one side and set aside. 2. Pan fry bacon to your preferred crispyness, add eggs and cook to your liking. 3. When cheese has melted, add tomato, place eggs on bread and top with avocado. – Tabasco sauce is always a good addition!